2 One-act plays by new members of the Society were performed for members only (not open to public). 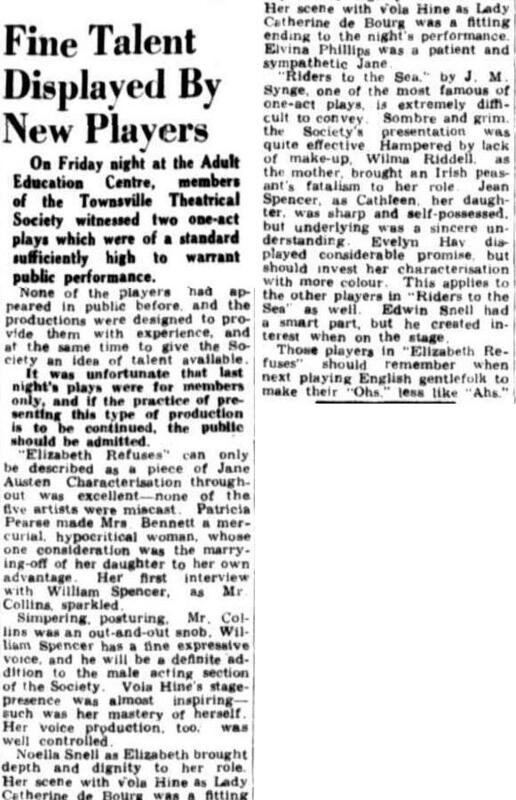 They were “Elizabeth Refuses” and “Riders to the Sea” and performed on Friday 21 Oct 1949 at the Adult Education Centre. On Friday night at the Adult Education Centre, members of the Townsville Theatrical Society witnessed two one-act plays which were of a standard sufficiently high to warrant public performance. None of the players had appeared in public before, and the productions were designed to provide them with experience, and at the same time to give the Society an idea of talent available. It was unfortunate that last night's plays were for members only, and if the practice of presenting this type of production is to be continued, the public should be admitted. 'Elizabeth Refuses' can only be described as a piece of Jane Austen. Characterisation throughout was excellent— none of the five artists were miscast. Patricia Pearse made Mrs. Bennett a mercurial, hypocritical woman, whose one consideration was the marrying-off of her daughter to her own advantage. Her first interview with William Spencer, as Mr. Collins, sparkled. Simpering, posturing, Mr. Collins was an out-and-out snob. William Spencer has a fine expressive voice, and he will be a definite addition to the male acting section of the Society. Vola Hine's stage presence was almost inspiring such was her mastery of herself. Her Voice production, too, was well controlled. Noella Snell as Elizabeth brought depth and dignity to her role. Her scene with Vola Hine as Lady Catherine de Bourg was a fitting ending to the night's performance. Elvina Phillips was a patient and sympathetic Jane. 'Riders to the Sea.' by J. M. Synge, one of the most famous of one-act plays, is extremely difficult to convey. Sombre and grim, the Society's presentation was quite effective. Hampered by lack of make-up, Wilma Riddell as the mother, brought an Irish peasant's fatalism to her role. Jean Spencer, as Cathleen, her daughter, was sharp and self-possessed, but underlying was a sincere understanding. Evelyn Hay displayed considerable promise, but should invest her characterisation with more colour. This applies to the other players in 'Riders to the Sea' as well. Edwin Snell had a smart part, but he created interest when on the stage.